Sage is like mistletoe, right? We see it during the holidays, but keep our distance, unsure of what will happen next if we get too close to it. Who put that there? Is it anywhere else? Gulp. Well, I can say with certainty, do NOT eat the mistletoe. Do not let the dog or your little sibs near the stuff. It’s in fact poisonous! My research shows that the plant used to relate to male vitality and romance (odd transition there), which then entered Christian tradition, who continued to kiss under the mistletoe like their ancestors. I’d like to think that mistletoe—as long as you don’t eat it—brings about happiness and warm feelings in my days, just like other items in the holiday scene. Sage especially is a healing element that is indispensable late in the year, although it is available fresh during most seasons. Where can sage and turmeric go? They need a set up. Both complement gamey meats and/or poultry, so combining the herb and spice in butter would be a great vehicle for incorporating them into your cooking! Time to make homemade butter, yes! Put heavy whipped cream into a blender, food processor, or mixer and whip on high speed. It will soon become whipped cream. Then the whipped cream will get progressively thicker, like whipped butter. After 2-10 minutes, depending on the speed strength of your machine, there will be a sudden and dramatic change. The milk fat and solids will separate out, leaving a milky liquid behind. This is buttermilk! Keep this process in mind when using an open stand mixer, and be sure to put the guards up to prevent it from flying all over your kitchen! After this, to prevent your butter from becoming rancid, it’s very important to drain away all of the buttermilk. Squeeze the butter as tightly as possible under ice col running water until all traces of milk have drained away and the water runs clear. That’s it! Only three steps! My boyfriend made the butter all by himself while I prepared meat the other day, so it’s a great dinner date activity. Thanks babe! 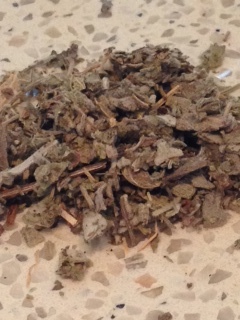 Now grab your dried or fresh sage, and mix it in with your butter. Sprinkle in turmeric now or later. You can use the butter to cook how, or form into golf balls and cover in plastic wrap to leave in the freezer for another occasion. 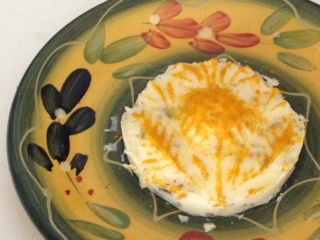 If you have a butter mold, you can show off a cool design and really make that butter look fawncy! Bon ap, to memory! PS… there will be more recipes on figswithbenefits for buttermilk!